Several months ago I posted a message to this site expressing my interest in the B & B OB20 kit and my concern about being able to complete it. 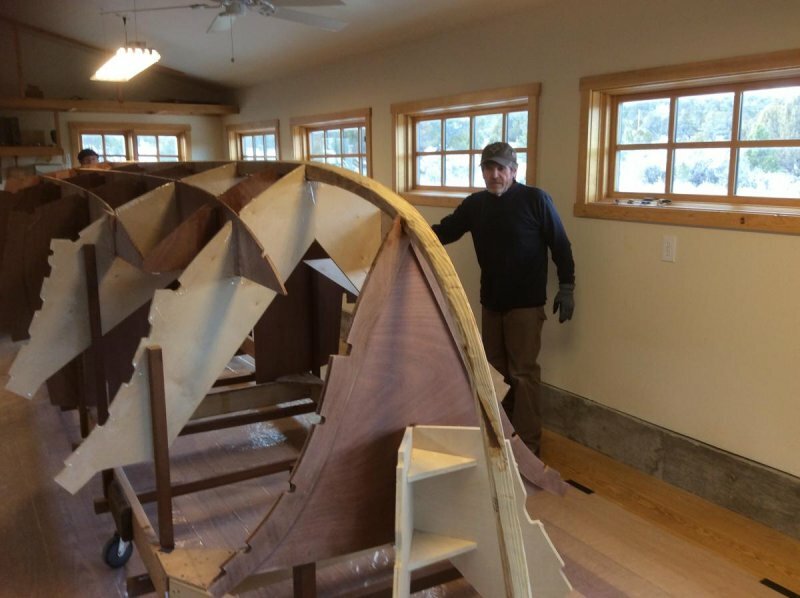 I've built a couple of CLC kit boats and a cedar strip canoe, but I wasn't sure that I actually qualified as a "competent amateur"...plus, it was clear that the OB20 kit would be a step into a different world for me. I was delighted to receive an immediate welcome and some much needed encouragement from several Advanced Builders, as well as, a couple of OB20 builders. Thank you. 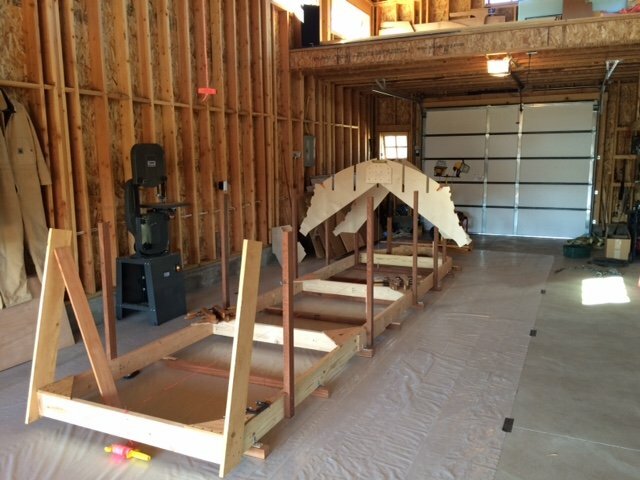 Within several weeks I had purchased the kit and started on the hull and transom jigs. 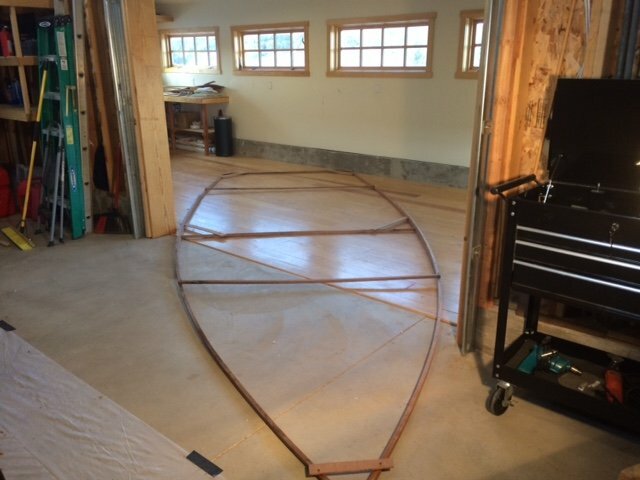 The transom jig creates a really sweet curve. Getting the hull jig plumb, level and square using standard framing lumber on a concrete floor sloping every which way was a bit challenging, but it's done and I think it's perfect. Currently, the bulkheads, frames and transom are up and I have installed and filleted the bottom stringers. Next will be the bottom panels. Given the thickness of the bottom plywood and the curves at the bow, I'm expecting a real wrestling match...any suggestions? It's also time to select material for the chine battens and side stringers...suggestions there would be appreciated, too. After my first post, someone said, "Post pictures", so I have attached a few. 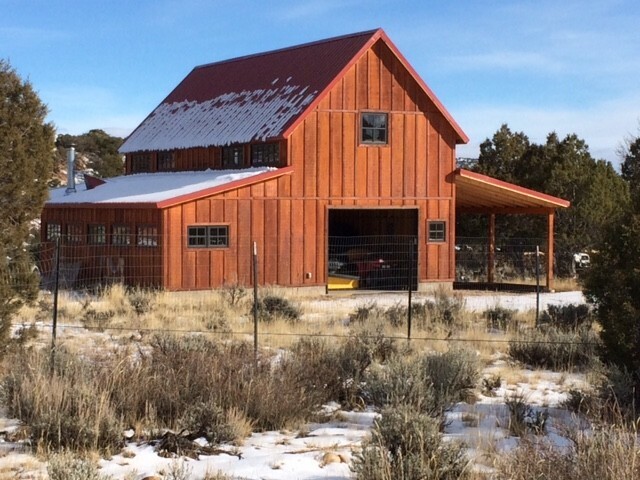 My shop is at 7,000 feet elevation and unheated, so I'm not sure how fast things will progress for the next few months. I'm currently trying to cure the last few fillets under a plastic sheet tent with radiant heaters. We'll see. Welcome back and thanks for the pictures. To improve the heat retention of your space heaters under a plastic tarp, I'd recommend you toss a few blankets over the tarps. It really helps hold in the heat. That's about as nice a build location as I've seen before, congratulations. Lastly, consider getting non-heating element or open flame heaters, to prevent fires in enclosed spaces. I use the cheap heated oil heaters, available at big box stores for about $20. No way they can cause a fire, so you can sleep peacefully at night with them on. 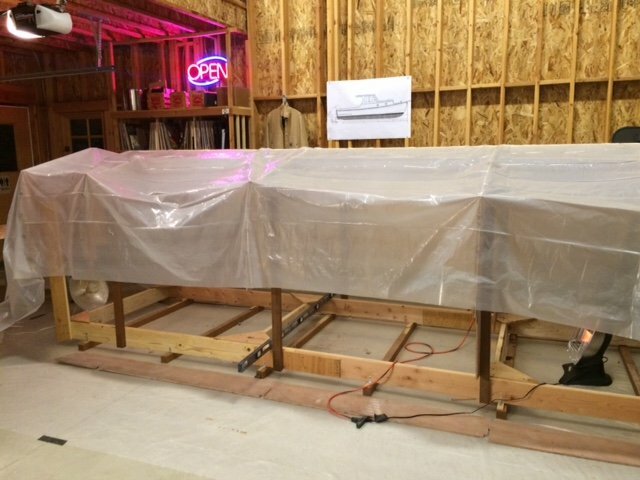 I am currently building an Outer Banks 26. I initially expected to use fir for my side stringers and chine battens. Wound up using Yellow Cedar and am quite happy with the choice. Fir is a bit stronger but the cedar is a joy to work with. Planes like butter, bends much more willingly than fir. The only down side is the dust can be pretty toxic. I was under the weather for a few days as a result of being a bit careless when I milled it up. Use a dust mask and you will be fine. The 1"x1" sheer clamp took a bit of persuasion but steaming the forward 6' made it bend beautifully. You look like you are off to a great start in a lovely setting. ENJOY! Boatbuilding in the desert. Wow. 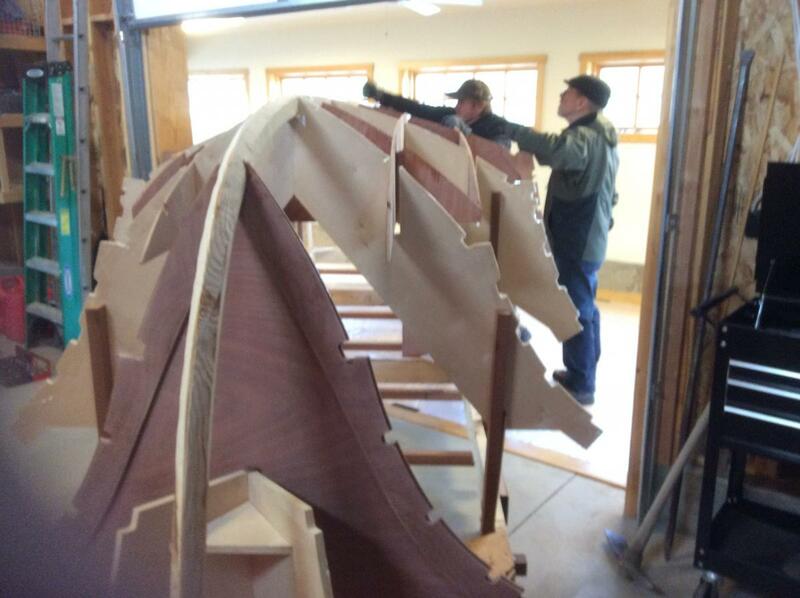 That's even more interesting that my situation-- boatbuilding in the Appalachian foothills! Thanks for the tips and for the nice comments about the work environment. The shop was a pre-retirement gift to myself. We needed a garage, I didn't have a workshop, the stars aligned and there we go. It was one of those rare occasions where we get to do something just right...almost. When I built it, a 10 foot door between the garage and shop seemed adequate. I didn't know there was an OB20 in my future. 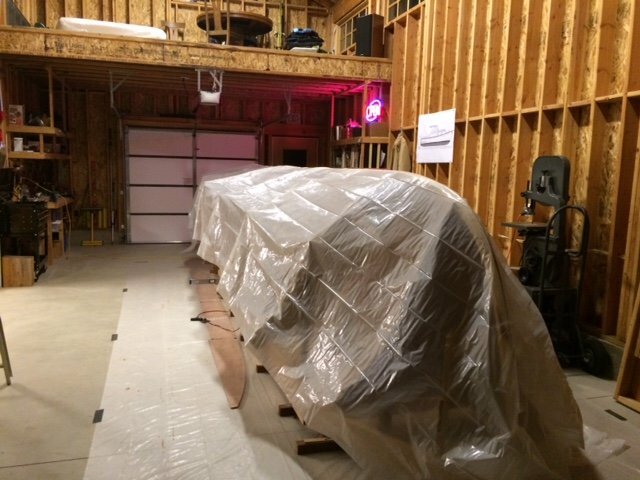 It was clear from the beginning that the I wouldn't be able to get the boat out of the shop, so work began work in the garage. Now that it's winter and the unheated garage is like a walk-in freezer, I'm becoming more creative. I've decided to move the project into the shop and worry about getting it out later. With no side stringers on, I was able to "cheat" between the bulkheads and frames, so it went in pretty easy. Getting it out will involve removing a pretty sizeable portion of the wall at one or both door jambs, but I can fix that and prefer doing that to working under plastic, or stopping work completely. I move slow enough as it is, without taking the winter off. At least it's not in a basement. Ken, I really enjoy and appreciate the photos of your OB26 build. You are an ace...and so is Chick. I use your pictures, Chick's photo link on the B&B website, as well as those from Striper Rick, 6210 and a few others as my building manual. Sure is a purty building! I'm glad you are working out the details. Just be thankful that you aren't building in a basement with NO door. These projects bring out the madness and creativity in us:). I realized around the time I started the OB26 that the clearance height of my front doors might not work when I build the pilot house. Might have to take some trim off at best. One thing has led to another and this week a 36' long bow shed is going up. The boat will need a home when is done anyway. Got the planking almost complete and it looks surprisingly fair. I will post some more pics soon. 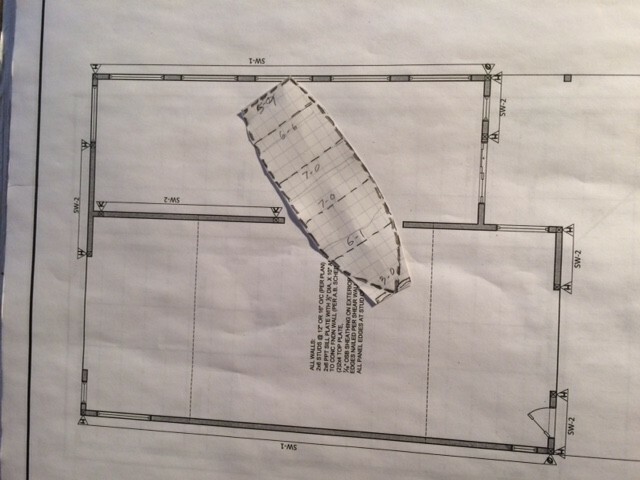 Looking forward to seeing your project take shape in that inspiring space! It's been many months (November) since I started work on my OB20. I didn't expect "life" to get in the way quite so boldly, but it did. I'm back at it now, with the bottom and some of the side stringers on...and a couple of items that I could use help with. Ken recommended steaming the forward sections of the shear clamp. I built a steam box and have experimented some. It's interesting how some species will hardly budge and others become wet noodles. I'm guessing that you don't glue hot/wet wood , but mechanically fasten it and hope that it stays put when dry and can be glued afterwards. Ken, you bent and installed one piece of the three piece shear clamp at a time, correct? When I bought the OB kit, it shipped with several 1 and 5 gallon containers of epoxy. Transferring the 1 gallon containers into the pump jugs via funnel wasn't too bad, but I can see me getting pretty sticky attempting the same technique with the big ones. There must be pumps, or something, for that? 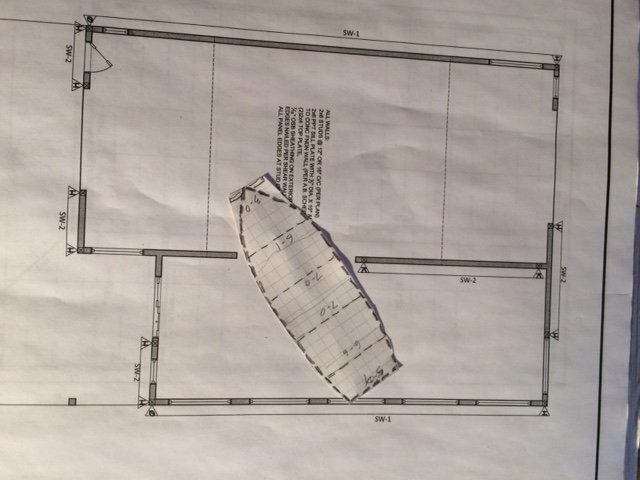 A couple of months ago, my wife and I were visiting Washington DC on a vacation trip and made the short pilgrimage to North Carolina to visit B&B Yacht Designs. Unfortunately, Graham was away in Texas at a race, but Alan was there and spent two hours showing us the entire operation and answering every question we could think of. He made us feel very special and glad that we made the trip. A highlight of the tour was the opportunity to climb around on OB20 #1. It's a beauty. I regret not meeting Graham, but Alan is a super guy and a great representative of the business..
Hopefully, I'll be able to send a photo of some of the side planks going on soon. pipe I had laying around. The pipe gets a bit noodle like but works fine. I have a bigger steam box for larger pieces of wood but this set up was perfect for this application. 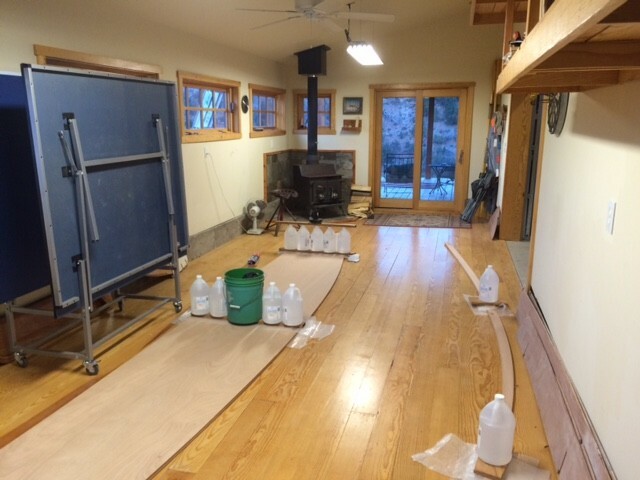 I was using air dried Yellow Cedar which bends nicely. Kiln dried fir, for example, is a bigger challenge. I did one piece of the the sheer clamp at a time. Let it sit for a few hours after steaming and then glue. 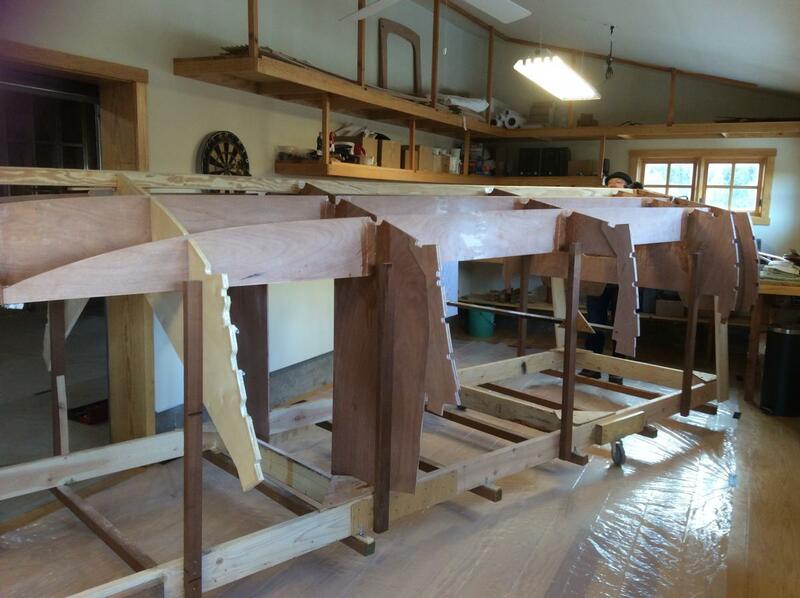 Getting sticky is a way of life for the modern boatbuilder:). We actually cut our 1" x 1" in to 1" x 1/2" to get it to go around the frames on our Ocracoke 256. I don't think you are facing the same amount of flair in the bow that we were dealing with though. On some of the larger stringers we boiled up a big pot of water and put old towels in then wrapped them around the timber at the critical bend. 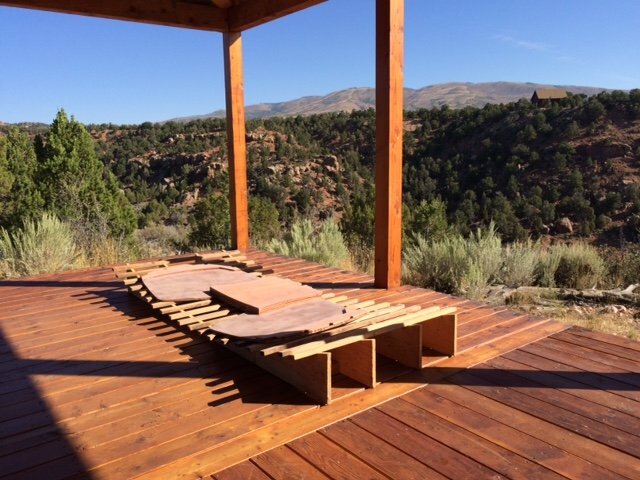 You can almost feel the timber relax as you coax it in to place. By the time the towels are cool enough to handle they have usually done their job. This is probably a "wetter"method than steaming and we have always left the glue until next day. Can't say this method will have general support but it seemed to work for us. Happy bending. Congrats on the progress so far- I am building the 20 as well- as far as the stringers go- I tried to get away without steaming...but that did not work. Ended up with Juniper for the stringers for the last two runs, with the sheerline out of 3 separate pieces and I still had to steam- Like Ken I used a 4" piece of PCV, capped with a rubber cap on one end and a couple of small holes drilled along the length. I bought a steam generator, but I know I'll use it for some other projects. That was after I broke quite a few. 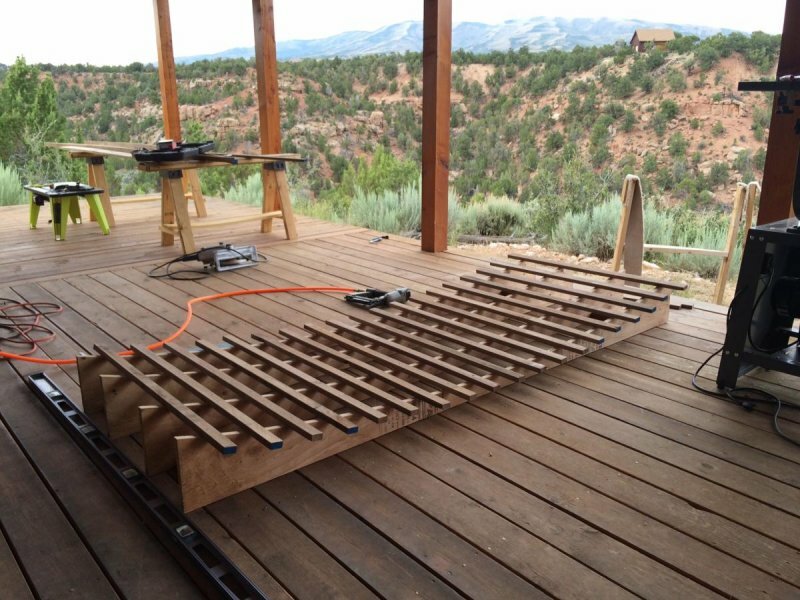 The side planks are fun as you really get to see the shape come together. I put the last one on this morning! I do recommend composite staples for the job. I use the Red Hawk ones, but Raptor makes good ones as well- It made the planking go much quicker than it would have, especially on the second layer- Heed Graham's advice about narrower planks at the bow- I ended up with 24" most of the way down the sides, 1 16" course at the start of the curvature and 8" the rest of the way. Doing it over I might even consider 6" at the points of most flare just to take a little of the stress out. By the end of the planking I was definitely ready to be done, but I am quickly progressing to post fiberglassing sanding- at which point I am sure I will wish I was still hanging planks. Beautiful building spot, and looking forward to seeing your progress! The side stringer bending went well and is almost complete. I steamed the some of the pieces that had the most acute bends and twists. I also tried the hot, wet towel alternative, just for grins. It worked too and is quicker. Ken, after asking the questions, I revisited your photo link and answered them for myself. My wife got a kick out of your steamer set up. She says watching boat builders is like watching reruns of Macgyver. Your link is great; can't wait to watch how you proceed, now that the boat is flipped over. JP, staples sounds like a great way to go, but don't you have to snug up the planks with screws and battens before stapling anyway? I'm not quite there yet, so I'm just visualizing, but it doesn't seem that I could press a stapler hard enough to forego the screws. Also, I found a plastic oil transfer pump at Harbor Freight for $7.00 and will see how they work on moving epoxy from five gallon containers to one gallon pump jugs. Carter- looks really nice! Love seeing your pics. I would have thought so, but I didn't need anything but the staples. Couple of the planks required starting the fastening to start in the middle and working out from there. The aft planks were easy, the forward ones were a bit more work. Typically, I took the 8" section, and cut to rough size, placed where it was going to go and held it with a couple/few staples in the middle of the plank. Then I would scribe for fit to the preceding plank, break the staples and bandsaw to fit. Mix up my epoxy with cabosil, apply, and refit the plank and staple. I cut notches in a flexible scraper and used that to apply. Worked well, and I hung every plank by myself. So far, the only screws I have needed were on the tight bends on the bottom planking. A few side planks are on. I screwed them and didn't think it was such a hassle, until my wife pointed out that with 8-10 fasteners per plank, 15 or so planks per side and two layers per side, I was looking at 500 more screws to fasten the side planks. 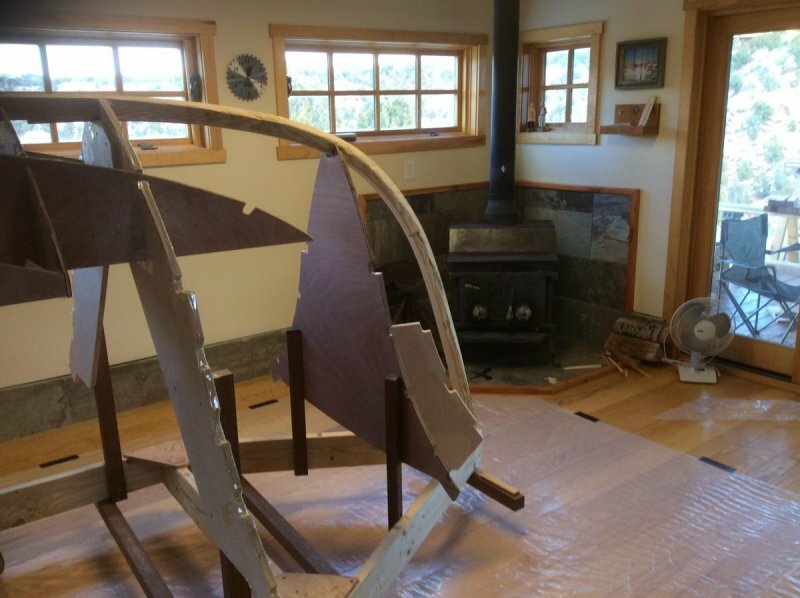 Probably no a big deal for wood boat builders doing it the old fashioned way, but it sounds like a lot for this plywood and glue rookie. Is there any reason not to use Raptor or Red Hawk nails, rather than staples? I used Raptor staples on my OB24#2 worked great. Much easier than screws. I agree with Russell. Worked well on my OB26. They tend to blow out a little wood when the come through to the inside plank but that is easily filled later. Screws and staples are a good combo. I use square head POCKET SCREWS. Much better than drywall screws. The square head and built in washer are a big advantage. Carter- I use the nails as well as the staples in my projects- for the planking, I think the staples worked better than the nails due to more surface area with the two legs and the crown helping to prevent pull out. Those square head pocket screws that Ken mentioned are great as well. I was really happy that I did not have any screw holes to fill on the side planking. The blow out mentioned is easy to fix, but I did find that getting a staple length that was just shy of the double planking thickness, and watching my air pressure on the staple gun to just set the crown at the surface, avoided most of that. Kennnee uses Robertson-drive (Square-headed) screws for a very good reason. Phillips-head screws are much more difficult to come by in Canada. There's a good reason for it. P.L. Robertson was a Canadian, whereas John B. Thompson was an American. (Thompson sold his design to Henry F. Phillips, of the Phillips Screw Company.) This became very apparent to me when we were vacationing in New Brunswick last summer. I needed a sheet metal screw for the travel trailer. Guess what I came home with? You guessed it. Actually, I like them-- they don't cam out nearly as often as Phillips-head screws. I suggest that we either use both names or both shapes when describing these screws. (Robertson & Phillips or square & cross, or maybe even Phillips and Canadian, LOL) But thanks, Kennnee, for giving me the nudge to look this up in Wiki.